When I found out that my mom was sick, I wanted to figure out the best way to support her and make a meaningful contribution. I am a doer and like to connect with people. The Multiple Myeloma Research Foundation (MMRF) made it easy to get involved and it immediately felt like we were doing something to support my mom and other myeloma patients. After learning about my mom’s diagnosis in January 2007, I saw that MMRF had a team for the NYC half marathon. My husband is a runner and a trooper — he said sure without hesitation and trained to run the race in a little over two months. Going into New York City to watch the race, seeing the supportive community and celebrating the runners was awesome! Team for Cures 5K is a wonderful event that our entire family can participate in together. Again, it is the community spirit and people coming together that is so important. Last June, my cousins, aunts and uncles, friends and our family rallied to walk together. We plan to make it an annual tradition! While working at a swim meet, I was talking to a friend whose husband has multiple myeloma. We were talking about doing something more and both of us had thought about Moving Mountains for Multiple Myeloma. On a snowy Saturday in between a swim meet and a track meet, I decided to apply to take on the Grand Canyon. Why not? I am so thankful for the work of the MMRF and have seen firsthand how the drugs are helping my mom. Our family grew up hiking and camping, and there is nothing I really enjoy more than hiking and being outdoors. Yay for the Grand Canyon — this something I can do! 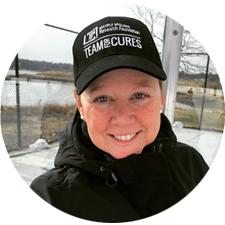 Working towards a cure feels like the right thing to do for my mom and other patients. Hearing my son say, “everything has a cure, you just need to find it” rings in my ears. Let’s all keep doing our part to find a cure for multiple myeloma. We will not stop until we do!